I was browsing around when I spotted these new Google Adsense Twitter Ad units. The Adsense units were clearly targeted to promote the Twitter account, with autorefreshing latest tweets and a clear call to action to follow the Twitter user. Upon loading, the ad autorefreshed showing the latest tweets of the Twitter account for around 7 times. The cursor shows that you could click the arrows and this will bring you to the new tweet. 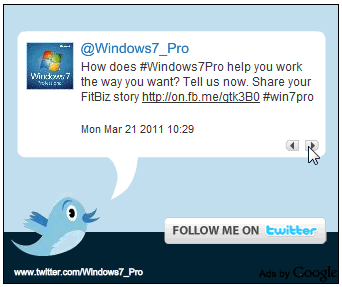 It seems clicks to these arrows will not be charged to the advertiser as you are browsing the tweets. Click the arrow and get a new tweet. The image, tweet link and “Follow Me on Twitter” seem to be clickable as observed by change of cursor image (we didnt click at it though). The call of action is clearly very good, and I am sure it will attract a high CTR. I like the Twitter Adsense units. 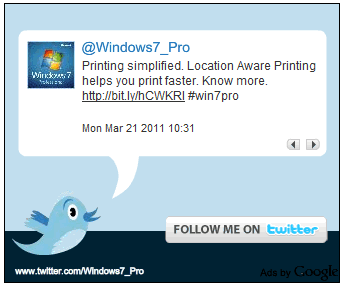 Have you seen such Twitter Adsense units on your site? We have spotted several strange Adsense ads over the years like ads with 2×2 ads, favicons, no titles, titles in italics and no Ads by Google and interactive keywords. Lets see how this will work out. Update: @blogsdna tweets that he has spotted such ad units before and “specifically only Windows 7 Twitter account is advertised that way”.